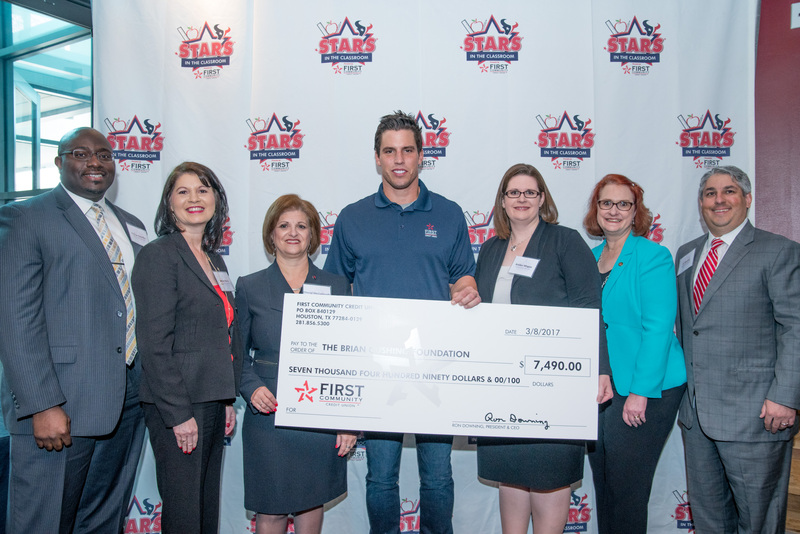 First Community Credit Union, The Official Credit Union of the Houston Texans and the Personal Choice of Brian Cushing, recognizes and rewards teachers as Stars in the Classroom. “Every time I get to hear the different stories of all the deserving teachers, I’m amazed at the way they touch kids lives and how much they make a difference,” says Executive Vice President and Chief Development Officer Cheryl McCullough. The sixth annual “Stars in the Classroom” Banquet recognizes ten educators for making a difference in their schools. “Stars in the Classroom” is a partnership between First Community Credit Union and the Houston Texans. As the face of the program, Houston Texans Linebacker, Brian Cushing welcomed each honoree with a handshake, photo-op and plaque. Known for being a leader on and off the field, Cushing explained how much teaching has impacted his adolescent and day-to-day life. From coaching his son in little league to giving advice to teammates, being able to teach others has come full circle. The program begins every year in mid August and spans till the end of October. During the contest period, ten teachers are nominated by past or current students and/or parents that see them go above and beyond in the classroom. 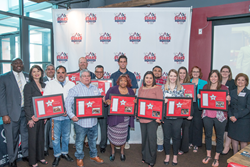 Each deserving teacher is awarded by a surprise appearance from Brian Cushing or one fellow Houston Texan who hand-delivers two football tickets, sideline passes, a customized football with Star Teacher’s name inscribed and a $500 donation to their school district. The student whose nominated teacher is selected, receives an autographed Houston Texans football. This year, “Stars in the Classroom” received around 390 nominations. Nominations are currently closed, but will open again in August 2017. During this year’s banquet, FCCU was able to surprise the star Texans linebacker with a donation check to the Brian Cushing Foundation. The mission of the foundation is to serve and honor the men and women who protect our country by providing resources and experiences to Houston-area veterans and their families. FCCU started out as a credit union for teachers and they have been an avid supporter of education ever since. Employees of FCCU are deeply rooted in many Houston area school districts where they volunteer on various committees in Spring Branch ISD and Alief ISD. For more information about the program and First Community Credit Union please visit FCCU.org.